Map of Antarctica and the Southern Ocean produced by the LIMA Project (Landsat Image Mosaic of Antarctica). It shows the topography of Antarctica (as blue lines), research stations of the United States and the United Kingdom (in red text), ice-free rock areas (in brown), ice shelves (in gray) and names of the major ocean water bodies (in blue uppercase text). 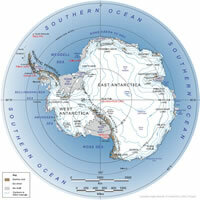 Antarctica is one of 7 continents illustrated on our Blue Ocean Laminated Map of the World. This map shows a combination of political and physical features. It includes country boundaries, major cities, major mountains in shaded relief, ocean depth in blue color gradient, along with many other features. This is a great map for students, schools, offices and anywhere that a nice map of the world is needed for education, display or decor. 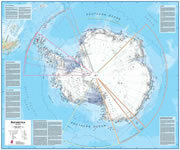 If you are interested in the geography of Antarctica, our large laminated map of Antarctica might be just what you need. It is a large map of Antarctica that also shows many of the continent's physical features in shaded relief. Region names, coastlines and surrounding islands are all shown on the map. 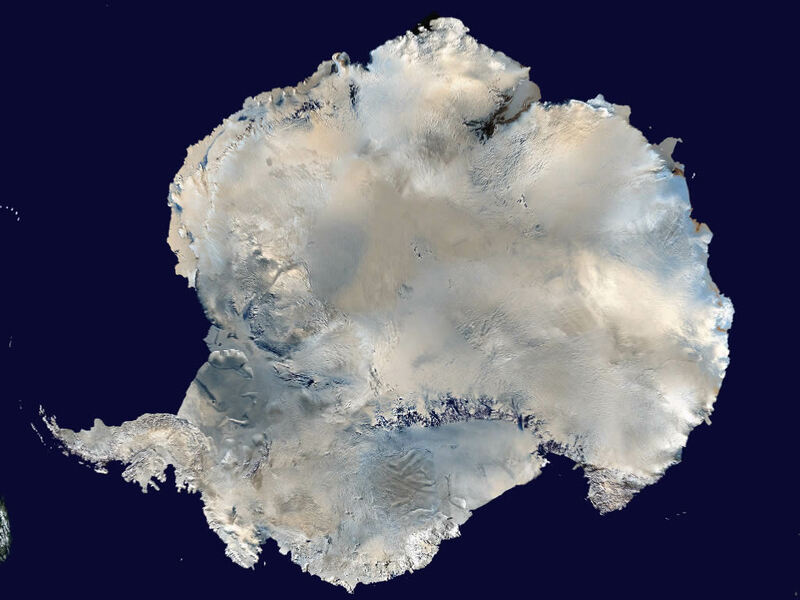 This satellite image of Antarctica was created by Dave Pape using NASA's Blue Marble data set, a custom C program, and orthographic projection formulas from MathWorld. Antarctica is the ice-covered continent of the southern hemisphere. Antarctica is surrounded by the Southern Ocean, and most of the continent is below the Antarctic Circle. Numerous countries make claim to portions of Antarctica and Exclusive Economic Zones offshore. There are numerous disputes over these claims. Amundsen Sea, Ross Sea, Kong Hakon VII Hav, Weddell Sea, Bellingshausen Sea, Ross Ice Shelf, Ronne Ice Shelf, Shackleton Ice Shelf, Prydz Bay, Brunt Ice Shelf, Filchner Ice Shelf, Ellsworth Mountains, Transantarctic Mountains, Palmer Land, Antarctic Peninsula, Larsen Ice Shelf, Oates Land, Victorialand, Queen Elizabeth Range, Subglacial Lake Vostok. Deposits of numerous minerals (iron ore, copper, gold, chromium, platinum, coal, oil, natural gas) are known to exist. However, there has been no significant exploitation to date. Blizzards, cyclonic storms, volcanism, icebergs. NASA has recognized an ozone "hole" above the continent which will allow increased levels of ultraviolet light to penetrate the atmosphere. This could damage the DNA of some marine organisms. Significant areas of the continental ice cover and ice shelves are at risk of melting from global warming. Copyright information: The images on this page were composed by Angela King and Brad Cole and are copyright by Geology.com © 2008. These images are not available for use beyond our websites. If you would like to share them with others please link to this page.